This salad is my version of the salade fermiere, sold at Paul Cafe, a French bakery chain with outlets in parts of Europe, America and the Middle East. 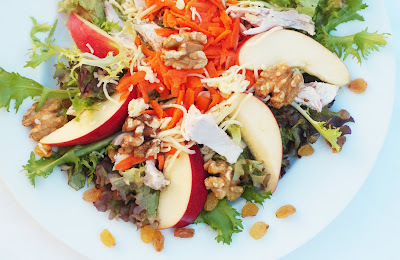 I had it the other day for lunch, and just loved the combination of foods: crunchy green leaves, sweet apple and raisins, warm grilled chicken slices, fresh shredded carrots topped with walnut halves and grated cheese. What I like most about this salad is that you can vary the amount of your favorite ingredients according to your taste. Mine would have lots of apple, nuts and raisins. My husband is not big on sweet stuff in savory food, so his one would have more chicken and carrots. The grilled chicken was served hot on the salad which definitely contributed to the salad. The meat pieces were rather big (bigger than on my photo) so their kept warm a little longer than bite-sized pieces on this rather big plate of salad. A healthy and filling timeless salad with a wonderful variety of flavors and tastes. Arrange all salad ingredients on a big plate, starting with the salad leaves at the bottom, topped with apples and warm chicken pieces. Arrange the carrots and cheese in the middle of the plate. Sprinkle raisins and nut around the edge of the plate. Combine all ingredients for the the dressing. Pour over the salad and serve immediately.